Unfortunately, writing an article and getting it accepted by Wikipedia are different things. The draft was rejected multiple times and eventually deleted, removing hours of work. Many academics have at least heard of a similar experience and it can be very discouraging. However, these stories can have a happy ending. We were able to get the draft back and post it as an article where it became one of the top two search engine hits for its topic. This article is about that process, and what academics can do to make sure their articles are accepted by Wikipedia. Wikipedia deletes many of the articles submitted to it and usually this is because the article subject is judged to be not notable, i.e. it is outside the scope of the encyclopaedia. As a rule of thumb, notable topics are those with substantial coverage in at least three sources which are independent of the article subject. There are specific notability rules for particular topics, such as academics or books. There is a further problem which is specific to theoretical terms. A theoretical term can be mentioned in multiple peer-reviewed papers and so seem notable, but if it is only used by one author it is not in scope for Wikipedia. Wikipedia, like any encyclopaedia, aims to codify knowledge that has stood the test of time. Coining new theoretical terms is common in social psychology papers, and only a minority of these neologisms go on to have a broader use. So if this policy didn’t exist, Wikipedia would soon be awash with articles on slightly differently-named principles. 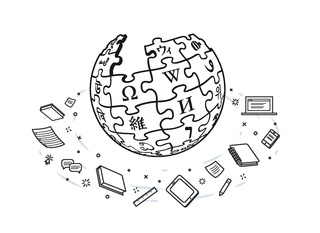 Wikipedia aims to summarise scholarly literature, not shape it, so its community is wary of articles being created to promote a technical term that is not already widely used. When Ashle Bailey, a research assistant in cognitive and evolutionary anthropology, wrote a draft about identity fusion, the Wikipedians who reviewed it blocked its acceptance under this neologism policy. The objection was that all the papers cited had the same person (William Swann, the originator of the term) as a co-author. This strikes me as an over-application of the policy. In very specialised academic fields, all the researchers will likely know each other and may collaborate on papers, so a star researcher’s name will appear on lots of the papers about a new topic. This implied that the term needed to be in broad use, not just within scholarly literature. This is not actually Wikipedia’s policy: plenty of things that deserve recognition in an encyclopedia are only documented in specialist publications, not the public web. The anthropologists, perceiving an unreasonable standard, abandoned the draft. When it had been left for six months, a Wikipedia administrator deleted it. Wikipedia has many areas for discussion. Each article has a Talk page to discuss its merits or weaknesses; each user has a Talk page where other users can post messages, and there are many dedicated noticeboards to discuss specific topics such as the reliability of particular sources. Some of the discussion about Identity fusion had taken place on users’ talk pages, some on the draft itself (and hence had been deleted). A straightforward search for Identity fusion brought up what we already knew: that an article with that name had been deleted. So to investigate what had happened we had to look behind the scenes. A blank search on Wikipedia (click on the search box and press return) brings up some additional options including an advanced search. The advanced search gives options to search many kinds of “behind the scenes” page: in this case, it helps to select User:Talk (users’ discussion pages), Wikipedia (policies, guidelines and noticeboards) and Wikipedia:Talk (other noticeboards or discussion of policy). Not all deletions are equal. Some articles are deleted because they are copied-and-pasted from elsewhere on the web, and thus break copyright law. Those should be thought of as deleted “with prejudice”. Some are blatant adverts, created to boost new commercial products or companies. In the present case, the draft had been deleted just because it had been abandoned. This is the opposite of a “deletion with prejudice”: having the draft back to work on is not much to ask. Wikipedia’s administrators are trusted contributors who have been given extra abilities, including the ability to retrieve deleted articles. If you are not an administrator but need an administrator to do something, it is a matter of knowing where to ask. Again, the advanced search was helpful. A search of the Wikipedia namespace for “undeletion” brought up the Requests for Undeletion noticeboard, which is monitored by a group of administrators. A post there resulted in the draft being restored within an hour. If an article has been deleted, you can ask for it to be restored as a draft: works-in-progress can exist in this state while avoiding the tagging and deletion attempts that would come if it were an article. I think the references in the original draft demonstrated that the topic was notable, but clearly others disagreed. Fortunately, in the couple of years since the deletion, new sources had come to light: mentions of identity fusion in academic journals by different groups of authors made this discussion moot. Adding these citations was simple and the resulting draft could be moved to a full article. To keep further complaints at bay, the style of the article still needed some adaptation. Officially, the writing style of a Wikipedia article is not a reason for it to be deleted. In practice, an article whose style does not conform will attract more negative attention, so it is advisable to get the style right early on. It is not a matter of good or bad writing style: Bailey and her group write highly-regarded research, but an excellently-written original argument is inappropriate for a encyclopaedic introduction, and vice versa. Being an encyclopedia is not just a description of Wikipedia’s aim, but a tight constraint on its structure and language. For example, a Wikipedia article lacks a conclusion section, is supposed to avoid evaluative language like “outstanding” or “leading” and must not make recommendations to the reader. A research paper will highlight the evidence and arguments that its authors find most persuasive. The Wikipedia article has to represent the spectrum of published academic opinion: where there is a controversy, it is not meant to take sides. A guideline is that if the author’s opinion on the article topic is obvious, they are not writing in an encyclopaedic way. Whereas the paper might advocate that “Identify fusion explains…”, Wikipedia needs to say “Identity fusion has been proposed to explain…” The Identity fusion draft mentioned some countervailing evidence with (“[citation], but see [other citation]”): on Wikipedia it needs to be made explicit what each paper says and how they are in conflict. Again because of the lay audience, citations in Wikipedia need to be very precise; not just author-and-year or author-and-paper-title. Ideally there should be a Digital Object Identifier (DOI) or, for medical/ psychological literature, a PubMed ID. Wikipedia’s citation tool now generates a full citation from just the DOI or PMID, so full citations with links are actually the quickest citations to create. They also need to be in-principle verifiable, so a citation of a paper in press, if there is no way to check its content, will not be accepted. With these improvements, the article now sits at B on Wikipedia’s quality scale– higher than the vast majority of articles. Sixteen people and one bot have made edits to it, and it gets around 4,000 views per year. It cites and links 39 scholarly publications. Another article by a member of the same group, Modes of religiosity, drew on the lessons of this episode and was published on Wikipedia with no problem. Academic papers, of an appropriate scope, can be adapted quite easily into Wikipedia articles, especially if they have been written with the lay audience in mind from the outset. In fact, copying text from open-access peer-reviewed literature to Wikipedia is so common it has acquired a name—Journal to Wiki publication—and this process is discussed in the separate case study “Extending the reach of a journal with journal-to-wiki publishing”. Thanks to Ally Edwards of the Digital Education at Oxford team for help editing this post. This entry was posted in digital scholarship, open access by poulterm. Bookmark the permalink.